Human amniotic fluid stem cells (hAFSCs) have features intermediate between embryonic and adult SCs, can differentiate into lineages of all three germ layers, and do not develop into tumors in vivo. Moreover, hAFSCs can be easily obtained in routine procedures and there is no ethical or legal limitations regarding their use for clinical and experimental applications. The aim of this study was to assess the effect of slow freezing/thawing and two different concentrations of DMSO (10% DMSO + 90% fetal bovine serum [FBS] and 5% DMSO + 95% FBS) on the survival of hAFSCs. hAFSCs were obtained from 5 pregnant women during amniocentesis at 16–22 weeks of gestation. The expression of pluripotency markers (Octamer-binding transcription factor 4 [Oct4] and NANOG) by reverse transcription polymerase chain reaction and cell surface markers (cluster of differentiation [CD31], CD44, CD45, and CD90) by flow cytometry was analyzed before and after the slow-freezing. Cell viability was assessed by trypan blue exclusion or MTT assay. Quantitative mRNA expression of Oct4, NANOG, cyclin D1 and p21 was determined by real-time PCR before and after the slow-freezing. Pluripotency of hAFSCs was confirmed by NANOG and POU5F1 (Oct4) gene expression before and after slow-freezing. All hAFSC cultures were positive for CD44 and CD90. A higher viability of hAFSCs was observed after freezing with 90% FBS + 10% DMSO. There was increased expression of NANOG and decreased expression of POU5F1 gene after freezing, compared to control cells (before freezing). DMSO and the process of freezing did not significantly change the expression of p21 and cyclin D1 genes in hAFSCs. Overall, our results indicate the applicability of slow-freezing and DMSO in cryopreservation of SCs. Bieback K, Kern S, Klüter H, Eichler H. Critical parameters for the isolation of mesenchymal stem cells from umbilical cord blood. Stem Cells 2004;22(4):625-34. https://doi.org/10.1634/stemcells.22-4-625. Carnevale G, Pisciotta A, Riccio M, De Biasi S, Gibellini L, Ferrari A, et al. Optimized cryopreservation and banking of human bone-marrow fragments and stem cells. Biopreserv Biobank 2016;14(2):138-48. https://doi.org/10.1089/bio.2015.0001. Kemp KC, Hows J, Donaldson C. Bone marrow-derived mesenchymal stem cells. Leuk Lymphoma 2005;46(11):1531-44. https://doi.org/10.1080/10428190500215076. Iftimia-Mander A, Hourd P, Dainty R, Thomas RJ. Mesenchymal stem cell isolation from human umbilical cord tissue: Understanding and minimizing variability in cell yield for process optimization. Biopreserv Biobank 2013;11(5):291-8. https://doi.org/10.1089/bio.2013.0027. De Coppi P, Bartsch G, Siddiqui MM, Xu T, Santos CC, Perin L, et al. Isolation of amniotic stem cell lines with potential for therapy. Nat Biotechnol 2007;25(1):100-6. https://doi.org/10.1038/nbt1274. Delo DM, De Coppi P, Bartsch G, Atala A. Amniotic fluid and placental stem cells. Methods Enzymol 2006;419:426-38. https://doi.org/10.1016/S0076-6879(06)19017-5. Klemmt PA, Vafaizadeh V, Groner B. The potential of amniotic fluid stem cells for cellular therapy and tissue engineering. Expert Opin Biol Ther 2011;11(10):1297-314. https://doi.org/10.1517/14712598.2011.587800. Bossolasco P, Montemurro T, Cova L, Zangrossi S, Calzarossa C, Buiatiotis S, et al. Molecular and phenotypic characterization of human amniotic fluid cells and their differentiation potential. Cell Res 2006;16(4):329-36. https://doi.org/10.1038/sj.cr.7310043. Thirumala S, Goebel WS, Woods EJ. Manufacturing and banking of mesenchymal stem cells. Expert Opin Biol Ther 2013;13(5):673-91. https://doi.org/10.1517/14712598.2013.763925. Gholizadeh-Ghaleh Aziz S, Pashaei-Asl F, Fardyazar Z, Pashaiasl M. Isolation, characterization, cryopreservation of human amniotic stem cells and differentiation to osteogenic and adipogenic cells. PloS One 2016;11(7):e0158281. https://doi.org/10.1371/journal.pone.0158281. Guo Y, Costa R, Ramsey H, Starnes T, Vance G, Robertson K, et al. The embryonic stem cell transcription factors Oct-4 and FoxD3 interact to regulate endodermal-specific promoter expression. Proc Natl Acad Sci U S A 2002;99(6):3663-7. https://doi.org/10.1073/pnas.062041099. Yu B, Cai H, Xu Z, Xu T, Zou Q, Gu M. Expressions of stem cell transcription factors NANOG and Oct4 in renal cell carcinoma tissues and clinical significance. Artif Cells Nanomed Biotechnol 2016;44(8):1818-23. https://doi.org/10.3109/21691401.2015.1105238. Hanna LA, Foreman RK, Tarasenko IA, Kessler DS, Labosky PA. Requirement for Foxd3 in maintaining pluripotent cells of the early mouse embryo. Genes Dev 2002;16(20):2650-61. https://doi.org/10.1101/gad.1020502. Walker E, Manias JL, Chang WY, Stanford WL. PCL2 modulates gene regulatory networks controlling self-renewal and commitment in embryonic stem cells. Cell Cycle 2011;10(1):45-51. https://doi.org/10.4161/cc.10.1.14389. Hough SR, Clements I, Welch PJ, Wiederholt KA. Differentiation of mouse embryonic stem cells after RNA interference‐mediated silencing of Oct4 and NANOG. Stem Cells 2006;24(6):1467-75. https://doi.org/10.1634/stemcells.2005-0475. Hawkins PG, Morris KV. Transcriptional regulation of Oct4 by a long non-coding RNA antisense to Oct4-pseudogene 5. Transcription 2010;1(3):165-75. https://doi.org/10.4161/trns.1.3.13332. Hyslop L, Stojkovic M, Armstrong L, Walter T, Stojkovic P, Przyborski S, et al. Downregulation of NANOG induces differentiation of human embryonic stem cells to extraembryonic lineages. Stem Cells 2005;23(8):1035-43. https://doi.org/10.1634/stemcells.2005-0080. Gawlik-Rzemieniewska N, Bednarek I. The role of NANOG transcriptional factor in the development of malignant phenotype of cancer cells. Cancer Biol Ther 2016;17(1):1-10. https://doi.org/10.1080/15384047.2015.1121348. Kern S, Eichler H, Stoeve J, Klüter H, Bieback K. Comparative analysis of mesenchymal stem cells from bone marrow, umbilical cord blood, or adipose tissue. Stem Cells 2006;24(5):1294-301. https://doi.org/10.1634/stemcells.2005-0342. Kim K, Doi A, Wen B, Ng K, Zhao R, Cahan P, et al. Epigenetic memory in induced pluripotent stem cells. Nature 2010;467(7313):285-90. https://doi.org/10.1038/nature09342. Gholizadeh-Ghalehaziz S, Farahzadi R, Fathi E, Pashaiasl M. A mini overview of isolation, characterization and application of amniotic fluid stem cells. Int J Stem Cells 2015;8(2):115-20. https://doi.org/10.15283/ijsc.2015.8.2.115. Spinelli V, Guillot PV, De Coppi P. Induced pluripotent stem (iPS) cells from human fetal stem cells (hFSCs). Organogenesis 2013;9(2):101-10. https://doi.org/10.4161/org.25197. Pashaiasl M, Khodadadi K, Richings NM, Holland MK, Verma PJ. Cryopreservation and long-term maintenance of bovine embryo-derived cell lines. Reprod Fertil Dev 2013;25(4):707-18. https://doi.org/10.1071/RD12018. Yong KW, Wan Safwani WK, Xu F, Wan Abas WA, Choi JR, Pingguan-Murphy B. Cryopreservation of human mesenchymal stem cells for clinical applications: Current methods and challenges. Biopreserv Biobank 2015;13(4):231-9. https://doi.org/10.1089/bio.2014.0104. Gholizadeh-Ghaleh Aziz S, Fathi E, Rahmati-Yamchi M, Akbarzadeh A, Fardyazar Z, Pashaiasl M. An update clinical application of amniotic fluid-derived stem cells (AFSCs) in cancer cell therapy and tissue engineering. Artif Cells Nanomed Biotechnol 2017;45(4):765-74. https://doi.org/10.1080/21691401.2016.1216857. Fiore M, Zanier R, Degrassi F. Reversible G(1) arrest by dimethyl sulfoxide as a new method to synchronize Chinese hamster cells. Mutagenesis 2002;17(5):419-24. https://doi.org/10.1093/mutage/17.5.419. Takase K, Sawai M, Yamamoto K, Yata J, Takasaki Y, Teraoka H, et al. Reversible G1 arrest induced by dimethyl sulfoxide in human lymphoid cell lines: Kinetics of the arrest and expression of the cell cycle marker proliferating cell nuclear antigen in Raji cells. Cell Growth Differ 1992;3(8):515-21. Lange S, Richard D, Viergutz T, Kriehuber R, Weiss DG, Simko M. Alterations in the cell cycle and in the protein level of cyclin D1, p21CIP1, and p16INK4a after exposure to 50 Hz MF in human cells. Radiat Environ Biophys 2002;41(2):131-7. Perin L, Sedrakyan S, Da Sacco S, De Filippo R. Characterization of human amniotic fluid stem cells and their pluripotential capability. Methods Cell Biol 2008;86:85-99. https://doi.org/10.1016/S0091-679X(08)00005-8. Steigman SA, Fauza DO. Isolation of mesenchymal stem cells from amniotic fluid and placenta. Curr Protoc Stem Cell Biol 2007;Chapter 1:Unit 1E.2. https://doi.org/10.1002/9780470151808.sc01e02s1. You Q, Cai L, Zheng J, Tong X, Zhang D, Zhang Y. Isolation of human mesenchymal stem cells from third-trimester amniotic fluid. Int J Gynaecol Obstet 2008;103(2):149-52. https://doi.org/10.1016/j.ijgo.2008.06.012. Dovgan B, Barlic A, Knezevic M, Miklavcic D. Cryopreservation of human adipose-derived stem cells in combination with trehalose and reversible electroporation. J Membr Biol 2017;250(1):1-9. https://doi.org/10.1007/s00232-016-9916-z. Livak KJ, Schmittgen TD. Analysis of relative gene expression data using real-time quantitative PCR and the 2−ΔΔCT method. Methods 2001;25(4):402-8. https://doi.org/10.1006/meth.2001.1262. Yuan JS, Reed A, Chen F, Stewart CN. 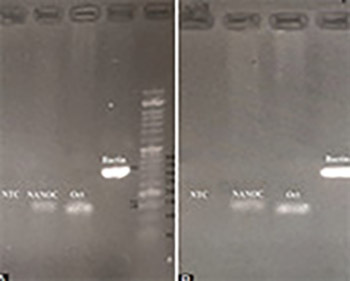 Statistical analysis of real-time PCR data. BMC Bioinformatics 2006;7(1):1. https://doi.org/10.1186/1471-2105-7-85. Ristimäki A. Tumor suppressor effect of the microRNA miR-519 is mediated via the mRNA-binding protein HuR. Cell Cycle 2010;9(7):1231-40. https://doi.org/10.4161/cc.9.7.11322. Loh Y, Wu Q, Chew J, Vega V, Zhang W, Chen X, et al. The Oct4 and NANOG transcription network regulates pluripotency in mouse embryonic stem cells. Nat Genet 2006;38(4):431-40. https://doi.org/10.1038/ng1760. Luo J, Sladek R, Bader J-A, Matthyssen A, Rossant J, Giguère V. Placental abnormalities in mouse embryos lacking the orphan nuclear receptor ERR-β. Nature 1997;388(6644):778-82. https://doi.org/10.1038/42022. Horvat S, Mcwhir J, Rozman D. Defects in cholesterol synthesis genes in mouse and in humans: Lessons for drug development and safer treatments. Drug Metab Rev 2011;43(1):69-90. https://doi.org/10.3109/03602532.2010.540580. Miki T, Lehmann T, Cai H, Stolz DB, Strom SC. Stem cell characteristics of amniotic epithelial cells. Stem Cells 2005;23(10):1549-59. https://doi.org/10.1634/stemcells.2004-0357. Schulz WA, Hoffmann MJ. Transcription factor networks in embryonic stem cells and testicular cancer and the definition of epigenetics. Epigenetics 2007;2(1):37-42. https://doi.org/10.4161/epi.2.1.4067. Nichols J, Zevnik B, Anastassiadis K, Niwa H, Klewe-Nebenius D, Chambers I, et al. Formation of pluripotent stem cells in the mammalian embryo depends on the POU transcription factor Oct4. Cell 1998;95(3):379-91. https://doi.org/10.1016/S0092-8674(00)81769-9. Weiss ML. Stem cells in the umbilical cord matrix: Isolation and characterization. Biol Blood Marrow Transplant 2007;13(11):1401. https://doi.org/10.1016/j.bbmt.2007.08.031. Pesce M, Schöler HR. Oct‐4: Control of totipotency and germline determination. Mol Reprod Dev 2000;55(4):452-7. https://doi.org/10.1002/(SICI)1098-2795(200004)55:4<452::AID-MRD14>3.0.CO;2-S.
Munoz M, Rodriguez A, De Frutos C, Caama-o JN, Diez C, Facal N, et al. Conventional pluripotency markers are unspecific for bovine embryonic-derived cell-lines. Theriogenology 2008;69(9):1159-64. https://doi.org/10.1016/j.theriogenology.2008.02.014. Ben-Shushan E, Pikarsky E, Klar A, Bergman Y. Extinction of Oct-3/4 gene expression in embryonal carcinoma x fibroblast somatic cell hybrids is accompanied by changes in the methylation status, chromatin structure, and transcriptional activity of the Oct-3/4 upstream region. Mol Cell Biol 1993;13(2):891-901. https://doi.org/10.1128/MCB.13.2.891. Ben-Shushan E, Thompson JR, Gudas LJ, Bergman Y. Rex-1, a gene encoding a transcription factor expressed in the early embryo, is regulated via Oct-3/4 and Oct-6 binding to an octamer site and a novel protein, Rox-1, binding to an adjacent site. Mol Cell Biol 1998;18(4):1866-78. https://doi.org/10.1128/MCB.18.4.1866. Matic I, Antunovic M, Brkic S, Josipovic P, Mihalic KC, Karlak I, et al. Expression of OCT-4 and SOX-2 in bone marrow-derived human mesenchymal stem cells during osteogenic differentiation. Open Access Maced J Med Sci 2016;4(1):9-16. https://doi.org/10.3889/oamjms.2016.008. Beltrami AP, Cesselli D, Bergamin N, Marcon P, Rigo S, Puppato E, et al. Multipotent cells can be generated in vitro from several adult human organs (heart, liver, and bone marrow). Blood 2007;110(9):3438-46. https://doi.org/10.1182/blood-2006-11-055566.